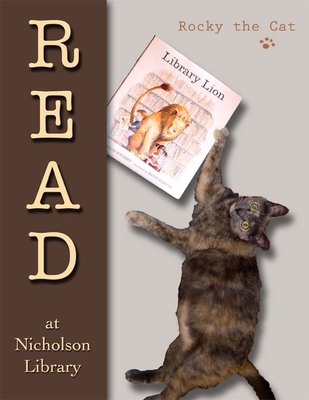 Rocky, owned by Paula Terry (Acquisitions, Cataloging, and Administrative Support Coordinator), reading Library Lion, by Michelle Knudsen, illustrated by Kevin Hawkes. Terry, Paula and Nicholson Library Staff, "Rocky READ Poster" (2008). READ Poster Gallery. Image. Submission 41.